Bridges Intervention is a resource designed for mathematics intervention in Tier 2 environments providing targeted instruction and support within the Response to Intervention (RTI) framework. Intended to complement regular math instruction, Bridges Intervention is ideal for small groups and can also be used with individuals. 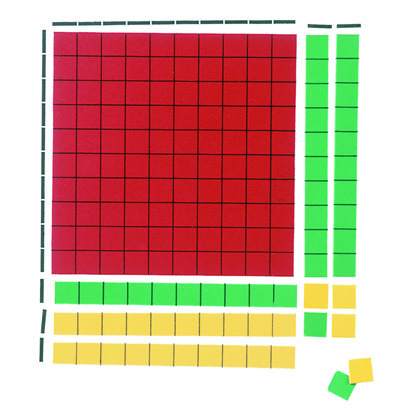 Students work with models that spur thinking and build confidence—starting with manipulatives, moving to two-dimensional representations and then mental images. Organized by content rather than grade, progress monitoring is key to the program. Each focused, 30-minute session is matched to student needs. 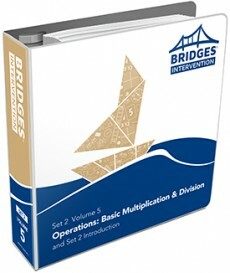 Bridges Intervention was written to address key numeracy and computation skills and concepts for each grade level, K–5. Specifically, Bridges Intervention deals with those clusters identified as major within the following domains: Counting & Cardinality (K), Operations & Algebraic Thinking (K–4), Number & Operations in Base Ten (K–5), and Number & Operations: Fractions (3–5). Printed Teachers Guides are designed for classroom use. The versatile three-ring-binder format allows teachers to add notes and other reference materials. (Color covers, black and white pages.) All guides are also available in electronic form on the Bridges Educator Site. Content for Bridges Intervention is divided into nine volumes. Each begins with an introduction to the core mathematical content and includes helpful charts for teacher planning. Each volume contains 8–13 modules that together constitute a coherent sequence of instruction on specific domains. Each module contains 5 sessions, for a total of 40–65 sessions per volume. The first 4 sessions feature warm-ups, a game or activity, and a guided practice page. Every 5th session is devoted to quick assessments designed to monitor students’ progress. A session is intended to last about 30 minutes. 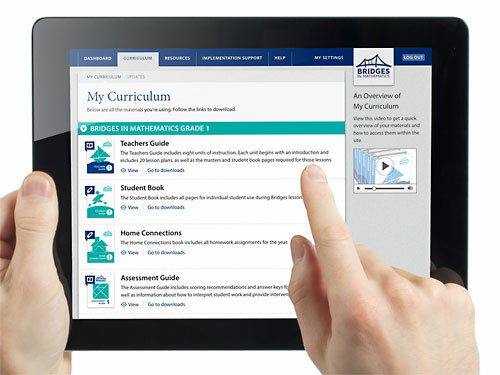 The Bridges Educator Site provides 24/7 online access and always up-to-date content. A free account is included with every purchase of a Bridges Intervention set. Each Bridges Intervention set includes an extensive collection of math-specific materials ideal for small-group instruction. Custom game pieces and carefully selected manipulatives make learning fun and interesting. Bridges Intervention works with students’ natural aptitude to learn through play, an approach especially important for struggling math learners. Games and activities consolidate and extend their comprehension of key skills and concepts. The kit features colorful premade components including card decks, spinners, and game boards that support each volume. Concrete representations of shapes and visual models provide tools for individual and small-group inquiry. Each Bridges Intervention set includes a manipulative kit that supports up to six students per volume. Bridges Intervention also incorporates our collection of free virtual manipulatives. The Bridges Intervention Workshop takes place at your school and is intended for interventionists, as well as classroom and special education teachers who provide intervention support. Other coaches, administrators, and support staff may attend as space allows. This two-day workshop offers guidance for an effective implementation of Bridges Intervention. We'll discuss best practices, placement assessments, progress monitoring, and more. Attendees will spend time with Set 1 materials on day 1, and explore Set 2 materials on day 2. Using the same content and structure as the Bridges Intervention Workshop (Contract), this open enrollment, face-to-face workshop is offered in two locations every May. Locations may vary by year. It is intended for interventionists, as well as classroom and special education teachers who provide intervention support. Other coaches, administrators, and support staff may attend as space allows. The Bridges Intervention Online Course is the online version of our Bridges Intervention Workshop. It is intended for interventionists, but classroom teachers, support staff, coaches, and administrators may attend as space allows. The course will walk participants through the structure of Bridges Intervention, placement assessments, progress monitoring, and the resources available on the Bridges Educator Site.